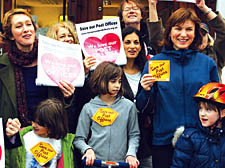 THE Post Office is facing a High Court challenge this week from campaigners fighting to keep open the Englands Lane branch in Belsize Park. Members of Primrose Gardens Community Association (PGCA) – who live in a quiet street off Englands Lane – have instructed a lawyer to seek a judicial review of the decision to close the branch. The Post Office announced earlier this month it would be shutting three other branches in Camden. The offices in South End Green, Highgate and Somers Town are due to close for business on June 17. But the New Journal learned yesterday (Wednesday) that retired magistrate Helen Lambert, secretary of the PGCA, and retired architect Noel Wurr have asked lawyer Richard Stein to act for them. They say the Englands Lane closure plan must be overturned as alternative post offices that will survive the cull will be too far away for elderly and infirm customers. Mrs Lambert, who collected more than 1,000 signatures from post office customers opposing the closure, said: “The other branches the Post Office have said we can use are simply not close enough for the large number of older people, disabled people and young families who live around here. Protesters fighting to save other post offices have yet to follow suit. South End Green Association chairwoman Pam Gilby hopes a judicial review bankrolled by City Hall will save their branch, but admitted she held out little hope. Meanwhile, Camden Council is due to start talks in the coming month with the Post Office on plans to take over branches, but not soon enough to save them from closing temporarily. No details have yet been released about the financial deal but the Town Hall hopes eventually to run the four post offices which will close in June.